It's not yet April but the showers have been pretty common in SoCal. It looks like winter has settled in (clearly the seasons didn't get the memo). While I wouldn't mind the sunshine and flowers, a little rain never hurt anyone. Especially if rainy days meant some Burberry accessories. A girl can dream right? In brighter news, have you seen the below image yet? It's a photo AnnaSophia Robb as the young Carrie Bradshaw. The Carrie Diaries is a CW pilot (that will hopefully get picked up this fall) that chronicles the Carrie Bradshaw growing up in the 80s. I can't wait to see the fashion featured on the show! Linking up for Friday's Fancies and Fashion Friday! I love Warby Parker! Thanks to Mayra of Life is Bananas, I found out about this amazing online company that sells rad glasses. I love the style of frames. According to the site, "The Warby Parker aesthetic is vintage-inspired, with a fashion forward twist - and every pair is custom fit with anti-reflective, polycarbonate prescription lenses." Yes, please. For a pair of prescription glasses with lenses it's $95 out the door. No shipping fees for the 48 continental U.S. states. AND for every pair bought, Warby Parker works with non-profits to donate a pair to someone in need. Now that's cool. It definitely made me want to buy from them that much more. Of course, the Home Try On service was a factor that also helped tremendously. Get this - you select five frames, color and style, and they send you them to you to try on at home for free! That way you can get a feel for the ones you like best and show them off to your friends and get their opinions. Such a perk for an indecisive person like me! After my Home Try On period, I decided that I wanted to order from Warby Parker and went with Zagg in Tennessee Whiskey. I placed my order on Tuesday, my prescription was verified Wednesday, and I had my glasses on Friday morning. That's super quick and impressive! If you're in the market for a new pair of glasses (they also have sunglasses! ), then I highly recommend Warby Parker. It's a great feeling to know that not only do you get to enjoy a rad new pair of glasses, but you helped someone else in need get a pair as well. Unfortunately, right now you can only buy them if you live in the U.S. but I'm sure they'll change real soon. Recently I was contacted by sneekpeeq and asked if I wanted to host a giveaway. To get a better understanding of the company I decided to sign up for their site (it's like a Groupon but with three amazing categories: living, style, and taste.) and was thrilled that I got a pair of pearl earrings for free just for joining! sneakpeeq was named one of the “Top 10 Best Social Aps of 2011" - so it's definitely a site to take note of. And here's your chance to get in on the action! If you are signing up as a new user, you'll get 20% off of your next purchase! AND one lucky entrant will receive a $20 sneakpeeq gift card!! 20% and $20 will go a long way on the site since items are reasonably priced. To enter the giveaway, simply select here to register for sneakpeeq. 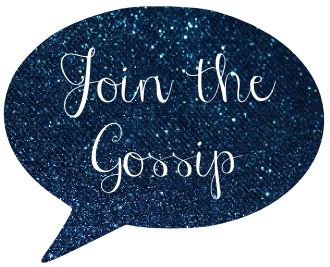 For an extra entry, become a follower of my blog, or let me know you already follow. I'll announce one winner next Tuesday, April 3. Good luck! I'm not quite sure how I've never selected Paul Wesley for Man Candy Monday. I've featured him over two years ago right after The Vampire Diaries hit TV, but not for this series. So now I am! I'm pretty sure I'm not alone in my obsession for this brooding vampire. I mean, look at that face! -His parents are Polish and he speaks the language fluently. -Changed his stage name in 2005 because his real last name was too hard to pronounce. -Was expelled from one high school as a result of to much fighting. I hope that brightened your Monday! Wanna pay it forward? Link up with your Man Candy. 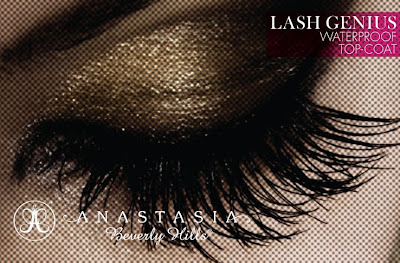 I am thrilled to be among a select few bloggers to have a tube of "Lash Genius" mascara by Anastasia of Beverly Hills. Unfortunately I don't have the longest lashes so it's hard to see in the picture below, but trust me when I say I'm loving this stuff! Available in May at Sephora stores, this clear mascara top coat works to waterproof, refresh, and protect mascara. It's amazing because it doesn't clump! In fact, I use it to smooth out the clumps of my base coast of mascara. When this product hits stores I suggest picking it up. For $21 it's priced reasonably! And there's another product that I'm looking forward to trying out, the Wish You Were Here Kit. You can learn a bit more about this kit in the video below. WISH YOU WERE HERE from Anastasia Beverly Hills on Vimeo. *I was given the Lash Genius in exchange for a review. This post is based on my honest opinion of the product. Now that it's officially spring, Southern California has decided to act like it's winter. It's actually colder now than it was in the months of December through February. Go figure. If it were warm enough, I'd wear a sweet outfit like this one for the baby shower I'm attending this weekend. Since it'll be in the 60s (which is freezing to us here in the LA region) I'll probably wear a maxi dress. What are you wearing, or wish you could wear, this weekend? 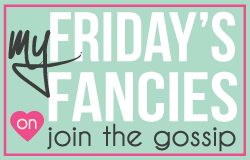 Link up for Fashion Friday and Friday's Fancies! If it's not one thing it's another in my world right now. Multiply my bad day by two weeks and that's the sorry state I'm in right now. 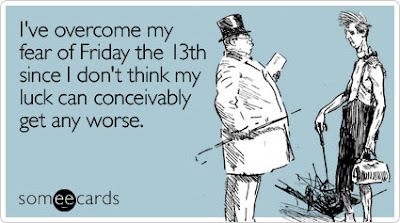 This week's what the Hell Wednesday is all about bad luck. But it has to turn around eventually though right? You can only have so many things throw you off until you're back on track. So despite the fact that on Monday it took two AAA visits to put my spare tire on after I got a flat, and the misfortune of going to Pep Boys yesterday and waiting for an hour just to find out that the tires ordered for me had been sold to someone else resulting in a return visit tonight, I am going to try to stay positive and wait for that good karma to come back around. This week's Man Candy Monday selection is someone who has just recently caught my eye, Matt Davis. As you all know I am a Vampire Diaries fanatic and upon re-watching the first season with my friend recently, it just clicked. He's cute! His role as the vampire fighting teacher suits him well. I'm hot for teacher! -Became interested in acting while attending The University of Utah. -Was a pizza delivery man before he made it in acting. -Has a random tumblr account where he mostly makes up his own storylines for The Vampire Diaries. -Says he'll remain a character on The Vampire Diaries but has a pilot called Cult on the CW. Are you all about on Mr. Davis? Think you're crushing on a cuter celebrity right now? Link up! 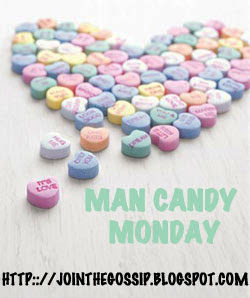 Just grab the button above, blog about your man candy of the moment, and add your name to the blog hop! Can't wait to see who you pick. Happy Friday and happy (almost) St. Patrick's Day! This week I've created a casual outfit for a night out on the town. Whether hanging out at a pub or painting the town green with a bar crawl, it's all about looking good while you're at it. Most importantly, having shoes that you can easily walk in after one too many drinks ;)Personally, I'll be wearing my beloved Shamrock Vans. If you want to recreate this outfit, here is the item info with links! Have fun and be safe this St. Patrick's Say! Over the weekend I took my parents to Doughboys in Los Angeles for my mom's birthday. After hearing that Oprah and Ellen DeGeneres are big fan's of the eatery's red velvet cake and seeing the extensive menu, I knew that I had to try it out. I ordered the vegetarian benedict and it was a big plate piled with eggs, potatoes, sliced tomatoes, salad and fruit. It was pretty good but nothing amazing. My mom and dad ordered a huge bowl of French onion soup and a large club sandwich to share. Unfortunately they weren't fans of the soup. It was too thick and reminded them of gravy. For dessert we ordered that famous red velvet I mentioned. The cream cheese frosting is amazing! It makes the cake. The thick layers of the goodness were the perfect ending to our lunch. Overall, I wasn't amazed with the experience but I probably would go back to give Doughboys a second shot. On Saturday I had the pleasure of attending The Vampire Diaries panel at PaleyFest with my friend Kate of the wonderful blog, Nautical By Nature. This was our second time attending. Two years ago we went to see TVD also, and it was the first time we met. Back then, the show was new and not as popular as it is today. This year the screaming fans seemed to have multiplied greatly. Despite the mas hysteria, once again we had an amazing time! In attendance were Julie Plec (Executive Producer), Nina Dobrev (“Elena Gilbert”), Paul Wesley (“Stefan Salvatore”), Ian Somerhalder (“Damon Salvatore”), Candice Accola (“Caroline Forbes”), Matthew Davis (“Alaric Saltzman”), and Kat Graham (“Bonnie Bennett”). The entire cast seemed to have good chemistry and spent the night cracking jokes. *Kat Graham was the quietest of the bunch. *Matt Davis is a bit of a creeper (in a funny way) and is campaigning for Ric and Elana to hook up. *Nina Dobrev was a bit shy but didn't hide the fact that she dates Ian in real life. *Ian Somerhalder the loudest of the bunch, hotter in person, and made jokes about his real life relationship with Nina. *Paul Wesely is the dark mysterious type and you can tell he really thinks about his words before speaking, and also hotter in person. *Candice Accola was a fan favorite and the audience cheered for her more than Nina! Here's a video I took of Paul and Ian joking about the brothers' vampire status and how they should mimic Forrest Gump's appearances in popular events over the years. If you'd like to see it, here's The Vampire Diaries Livestream of the event. Overall it was a great time and I highly recommend those in the LA area attend PaleyFest in the future. It's held once a year and boasts great lineups. This year included the shows Revenge, Once Upon a Time, Castle, and many others. You won't be disappointed! If interested, check out my recap of the first Vampire Diaries at PaleyFest two years ago.